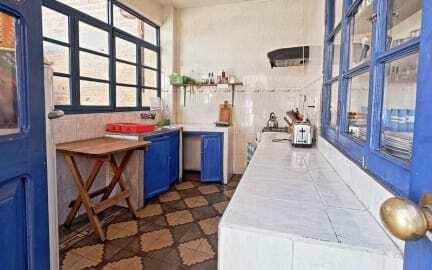 La Dolce Vita is a small, friendly guesthouse that offers a charming setting for your stay in the very centre of Sucre. Enjoy some time off with us in the White City, renowned for its easy-going, colonial flair. La Dolce Vita is all about dreaming your day away on our sunny terrace, reading a book from our book exchange in our patio, watching a movie in our lounge, sharing your travel experiences with other guests and preparing your favourite recipes in our guest kitchen. Our rooms are clean, comfortable and spacious. They come either with a private or a shared bathroom. Nice, hot, gas powered showers 24/24. WiFi available for checking your emails. We are happy to welcome you whether you travel alone, as a couple, with one or two friends or as a family. In fact, we are a Swiss-French family and glad to speak with you in English, German and, of course, in French. 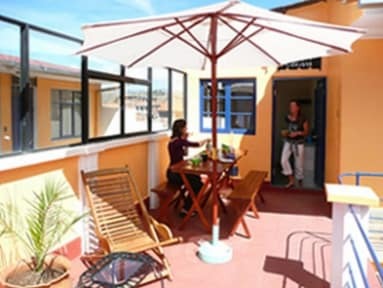 La Dolce Vita is centrally located, 1 block from the central market away, 2 blocks from San Francisco church and its souvenir shops and 3 blocks from the main square Plaza 25 de Mayo. We are pleased to help you find your way around the city, tip you off on what to see and where to eat as well as help you choose a Spanish school. We look forward to welcoming you soon at La Dolce Vita Guesthouse ! Thank you for letting us know your approximate arrival time when making your advance reservation ! Opening hours for arrivals : from 7am to 9pm only ! We are happy to store your luggage until your room is ready and you may also use our facilities. Official check out at 11am. You are welcome to store your luggage with us for free and use our facilities while waiting for your connection towards your next destination. Please note that our fixed rates are exclusively in Bolivianos. Other currencies displayed on this site simply give you a rough idea about our rates in your own currency. Thank you for paying cash, in Bolivianos only, upon your arrival. What do our rooms with en suite (private) bathroom include ? What do our 4 rooms with a shared bathroom include ?